After blowing a two-goal third period lead and losing 3-2 in overtime to a down Notre Dame team (9-9-2), Miami (12-6-0) rebounded yesterday with a convincing 3-0 win over Cornell in the consolation game of the Florida College Hockey Classic. That Miami did not handily win the Florida tournament is disappointing in that none of the other three teams have a winning record. In fact, Notre Dame has dropped contests to duhOSU (5-9-1), Lake Superior (4-17-1), and Rensselaer (6-13-1), the team Miami will face this weekend in non-conference action. Now, there has been talk of whether there was or was not video review of the tying goal late in the third period which Miami contested was directed in off a glove. Frankly, it was almost impossible to follow the audio call on Sunday because it was so bad so we aren’t making a claim that Miami was robbed. The fact is, regardless of how it happened, Miami let another late lead evaporate, something that has plagued this team for years. Heading to Troy, N.Y. this weekend, Miami will face a two-game road series against ECAC foe, Rensselaer, who I saw in person here in Denver earlier this season. RPI is not a good team. I said so then and the Engineers have done nothing evidenced by their record to disprove my take from a few months back. Miami should sweep this team, and frankly, can’t afford another loss against a team outside the top 30 of the PWR. What I recall about RPI was that they had good size, decent speed but are offensively inept and defensively suspect. I guess that’s about what you’d expect from a team that’s 6-13-1. Miami will once again be without the services of sophomore winger Anthony Louis who has looked good representing Team USA in the WJC this week. The RedHawks need to play their game, get out with two wins and prepare to reenter conference play next week when they travel to St. Cloud, Minn. to face the Huskies on January 9-10. 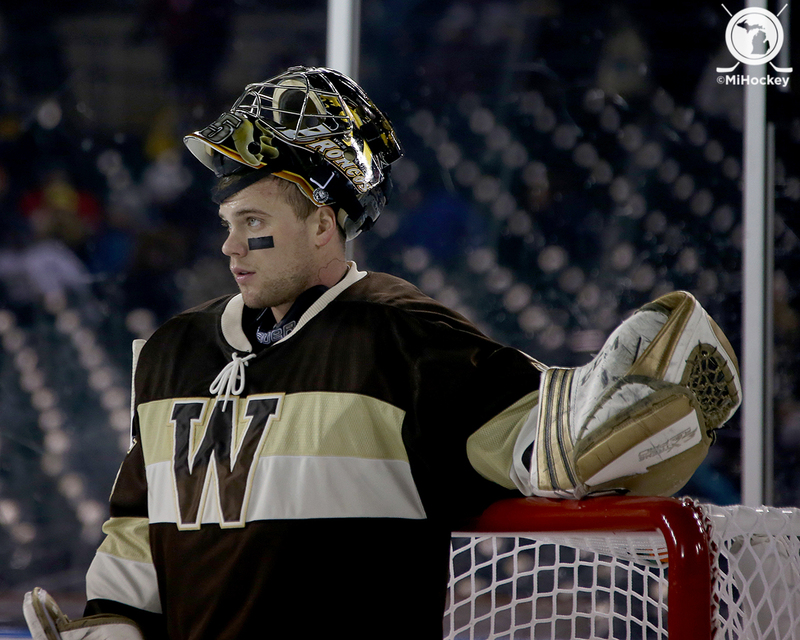 – Ryan McKay was in net in the 3-2 OT loss to Notre Dame. His first start since November 15 at North Dakota. – Jay Williams got the shutout on Monday, his 3rd of the season. He is now 3rd nationally in GAA (1.66) and tied for 6th in shutouts. – Conor Lemirande and Taylor Richart scored their first collegiate goals in the two games. 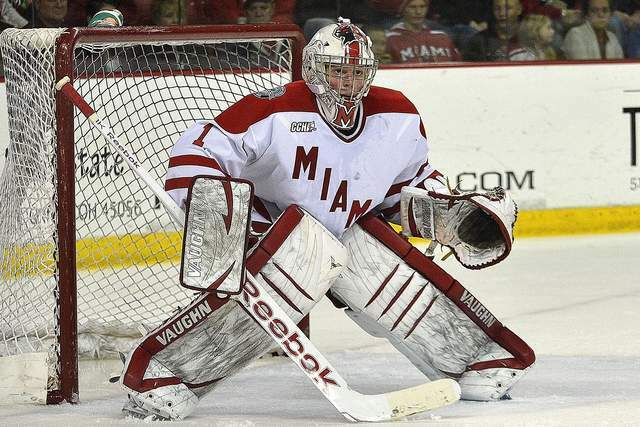 – Miami is currently 6th in the PairWise rankings that typically determine the NCAA tournament field. After a thrilling split in North Dakota where the RedHawks earned their first ever win in Ralph Englestad Arena, #7 Miami (8-4, 4-2 NCHC) entertains the Western Michigan Broncos (3-6-1, 1-4-1-1 NCHC) tonight and tomorrow. With last year’s disappointment beginning to fade, Miami will look to avoid the winter swoon and continue to avenge some of last season’s heartache. Miami and Western Michigan are just about even when it comes to the head to head matchup all-time. We’ll let you decide who is correct on the all-time record between these two teams: Miami says 57-56-10 to their advantage (Miami Record Book, page 47). WMU says 57-55-10 to their own advantage (WMU Record Book, page 46). By my count, since 1999-2000 when Enrico Blasi took over, Miami is 24-12-5 and overall, Miami’s got the edge at 57-56-10. In any event, we know that last season, Miami was ranked #13 in both major polls as they kicked off the second half of the season in Kalamazoo. 2 1-goal losses to the hands of the Broncos and 2 more defeats just a month later, and Miami’s tailspin was real. Starting with WMU, Miami lost 13 of their last 16 regular season games last season. This year, the teams are currently headed in different directions, and Miami has no doubt forgotten about the 4 losses to WMU last season. And after his first three years at the helm in which he led the Broncos to winning seasons, why not? After a stretch of 8 years in a row with a losing record, Western Michigan earned itself a spot in the new “SEC of College Hockey” with it’s up-and-coming label. Jeff Blashill – a former Miami assistant – had something to do with the rise of WMU as well, but the sustained success is now credited to Murray’s resume. Undrafted Junior Nolan LaPorte leads a list of relatively unknowns from WMU in scoring with just 9 points on the year. For reference, Miami has 5 players with 9 or more points already. The 2nd and 3rd highest scorers for WMU are defensemen, so it’s safe to say their scoring is coming from a lot of different places. After several years of well known NHL draft picks and NCAA studs, the Broncos have just 3 Seniors on the roster. All 3 of them (Forwards Will Kessel, Justin Kovacs and Goalie Frank “The Tank” Slubowski) have 100 or more games played in their time in Kalamazoo. But this team is young and promising. Look no further than their Junior Goalie Lukas Hafner, who will likely see the majority of play this weekend. He sports a .916 save percentage and 2.16 goals against average in his 7 appearances, with a 2-3-1 record to show for it. Western Michigan has 3 NHL draft picks on their roster and each of them are 6’2″ or taller, with Sophomore D-man Mike McKee topping out at a whopping 6’5″ and 250 pounds. Eat a salad, brother. As Miami has done, Western has greatly increased their size with 8 of their 9 current defensemen logging in over 6 feet tall (and the 9th is 5’11”). That size will be on display as Miami and WMU usually play a physical style with lots of penalties. Needless to say, special teams play will be crucial this weekend. Despite the record, Western is not being outscored by much with a -3 goal differential on the season. They’re in games and have an 0-3 record in 1-goal games. Turn those around and 3-6 becomes 6-3 and they are leading the league instead of Miami. Jay Williams is making it clear that last season was a departure from the norm and rides an 8-1 record into this weekend’s play. For some reason, Coach Blasi tried to get Ryan McKay back on track in the biggest series of the season with a start on last Saturday night. We don’t exactly agree with that decision, which turned out to be a poor one. I won’t go as far as to say that the 2-headed goalie monster is dead, but I won’t be surprised to see Jay Williams in the remainder of the big games this year. This weekend should be a bit of a “relax” moment and we will likely see the rotation one last time. In any event, Miami stands at a crossroads. Just take a look at last year’s results compared to this year after 12 games. In 2013-14, Miami had a 7-4-1 record allowing 3.4 goals per game. Fast forward to 2014-15: an 8-4-0 record allowing 3.0 goals per game. Miami finished 8-16-2 last year, was last in the NCHC and had its streak of 9 consecutive NCAA tournament appearances snapped. Where do we go from here? Miami’s 5-1 at home this year and the one loss was due to a bad stretch of about 20 minutes of play against St. Lawrence. Western Michigan is 0-5 on Friday nights. After a sweep of Western Michigan tonight and tomorrow, Miami should be again headed for the NCAA tournament. Both games can be seen on NCHC.tv (via paid subscription) and heard on 1450 WMOH, 1490 WKBV and on muredhawks.com. Saturday night is Autograph Night, so stick around and get some signatures and selfies with the team. In what can only be described as a season to forget, Miami’s run to the inaugural NCHC title game will at least provide a silver lining to an otherwise dismal year. In the end, Miami tried valiantly to salvage the season over the past two weekends, but ultimately it was Miami’s lack of consistency, tight defense and, at times, leadership that was its undoing. Never was Miami’s inconsistency more apparent than tonight, which was a reminder of how the team played for much of the year. The squad seemed disinterested and was certainly not the team we saw a night before against North Dakota. As a result, the Pioneers seized upon Miami’s uncertainty and took a 2-0 lead into the locker room after the first period. In his postgame press conference, Miami head coach Enrico Blasi addressed Miami’s lack of energy at the start of the game. As Miami began to find their legs, they erased the two goal deficit by netting two of their own in the second but Miami would fall victim to its own inconsistency as mistakes they avoided last night crept back into their game. So, it goes that Miami made things interesting late as Anthony Louis (who made the all-Tournament team) scored his second goal of the night with just 90 ticks left and Miami even had a couple good chances to tie the game 6-on-5. Louis will be a big part of the program moving forward and his surge down the stretch makes you feel good about the offense even if Riley Barber or others leave early. Blasi was asked about his goaltender, Ryan McKay, who while allowing a soft goal, probably played well enough to win. So, as this year concludes, we’re left to wonder about next year much earlier than we’re used to in these parts. The NCAA tournament will start next week without Miami for the first time since the ’04-’05 season. Well, sometimes it’s better to be lucky than good and in the 2nd period, Miami got two HUGE breaks that led directly to two goals. So, it all comes down to this. Whomever digs deepest and wins the third period will claim the hardware and the ticket to the dance next weekend. – Cody Murphy has been all over the place. He has easily been Miami’s hardest working skater. He leads Miami in SOG with 3. – Ryan McKay seemed to regain his composure and is playing the puck much more effectively. – Sean Kuraly’s goal was of the “seeing eye” variety and perhaps surprised Brittain. The goaltenders are now even in allowing bad ones. – Miami really shut down Denver in the 2nd and kept them to the outside. – Anthony Louis now has a goal in his last three games and 11 on the year. – Denver was really clutching and grabbing, and getting away with it. Miami was having difficulty entering the zone, but with the two markers, sometimes it’s good to be lucky. Third period hockey for all the marbles. Let’s do this, boys! Well, that was an ugly period of play with Miami looking tentative and unsure of themselves and completely unlike the team we saw last night that took it to UND. Here are a few initial thoughts and stats. – Riley Barber’s early penalty was a foolish slash from behind and led to DU’s first goal late on their first powerplay. – Miami looks incredibly tentative and almost disinterested. – Ryan McKay is not on his game tonight. He’s fighting the puck and had another puck slip past after hitting him in the chest. That’s happened several times this year and can’t happen in a big game such as this. – Miami did a fairly good job keeping DU to the outside, but they need McKay to pick it up and offensively, the RedHawks need to drive to the net and get traffic in front of Brittain. When they did that, they had success generating chances in the first period. – Denver blocked 3 Miami shots in the first period. – Faceoff wins were even at 9 apiece. You know what they say, a two-goal lead is the worst lead in hockey. Let’s hope that’s the case tonight as Miami will need to come from behind to claim the trophy and continue this late season run. Miami and Denver will battle for this baby. If at the beginning of the season you said that Miami and Denver would play for the first ever NCHC tournament championship, no one would have been surprised. However, if the same question were posed about a month ago, it would certainly have elicited curious looks. But, that’s how quickly a season can change. Eighth seeded Miami will face sixth seeded Denver with the winner earning both a championship trophy and a trip to the NCAA tournament. With St. Cloud firmly in the field and Miami or Denver earning an automatic bid, the NCHC will have at least two teams represented. But, if North Dakota can rebound and defeat Western Michigan in today’s third place game, UND may have a shot to get in if they get help. If Miami prevails tonight, that would mean playing in the Midwest Regional in Cincinnati where the RedHawks are the host institution. After a regular season that saw Miami finish last in their new conference, the magnitude of their current four-game winning streak was not lost on head coach Enrico Blasi. Miami has gone 2-2 against Denver this year and has had a pretty good run of success against the Pioneers over recent years. With the way the RedHawks are playing, nothing would surprise me. And, if the Miami team that showed up last night against North Dakota is there tonight, I think it’s reasonable to believe Miami will live to play on next weekend in Cincinnati. If not, at least this late season run breathed some life into an otherwise lackluster season. Rise and Prevail! Let’s do this! Enrico Blasi, Blake Coleman and Austin Czarnik address the media following Miami’s 3-0 victory over North Dakota. Miami is coming together as a team at just the right time. In their most complete game of the season, at precisely the right time, the Miami RedHawks defeated North Dakota 3-0 tonight at Target Center. With one more victory, Miami will qualify for the NCAA tournament where they would be the #4 seed in Cincinnati. Imagine that, a home game in the NCAA tournament sits as a reward for persevering through a tough season. Regardless of how they got here, Miami is truly improving every day and is now a threat to make a serious run if all continues to go well. With the win, the RedHawks were able to gain a measure of revenge and satisfaction after sustaining a 9-2 drubbing at the hands of UND in Grand Forks in February. Thinking back to that game and then looking at this Miami team tonight, you wouldn’t believe they are the same squad. A commitment to team defense. Timely scoring from the prime scoring areas. Going to the hard area of the ice and sticking up for teammates. A true team victory tonight. With the victory, the journey does indeed continue for at least one more game as Miami advances to the first ever NCHC championship game where they will face the Denver Pioneers who advanced by knocking off Western Michigan 4-3 in a hard-fought game. In the first period, Miami used their speed to its advantage and came out flying. Riley Barber, Sean Kuraly and Anthony Louis were particularly effective as the RedHawks denied space and time to UND. But as the period wore on, UND started to push back winning puck battles and picking up the physical play. Head coach Enrico Blasi said that he was pleased with the overall effort from his team in keeping UND to the outside which would be a theme throughout the game. As second period began, both teams seemed sluggish. While McKay barked, Miami and UND continued their battle with neither team giving much. But, the game turned on a simple play when with 30 seconds left in the second period, UND was called for icing and rather than sitting on the one goal lead, Blasi sent out the number one line with a twist. With the faceoff to the right of Gothberg, junior Blake Coleman took the draw winning it cleanly to Austin Czarnik who carried the puck between the circles and fired a wrist shot back against his body beating Gothberg high. Miami was then able to carry the momentum of the late goal into the third period and took the play to UND. Unlike the first two periods where it could be argued that UND had the better of most of the play, Miami dominated the third period culminating with yet another wrister from between the circles when at 6:13 of the period, freshman Anthony Louis took the drama out of the outcome and gave Miami a 3-0 lead. Tomorrow night, Miami will face Denver, a team they’ve beaten twice this year. They will face arguably the best goaltender in the league in Sam Brittain and in order to advance to the NCAA tourney, will need to continue to commit to defense and get scoring from throughout the lineup. The puck drops at 7:38 PM CST and will be televised on CBS Sports Network. Greg Waddell will have the Miami call on Miami All-Access as well. With a goal in the final minute of the 2nd period, Miami takes a 2-0 lead into the 3rd period of the second semifinal here in Minneapolis. – The first 10 minutes of the period were largely throw-away. Neither team really did much. – UND dominated the second half of the period until about the 17 minute mark when Miami began to find its legs. – UND iced the puck with 30 seconds left and you just had a feeling that giving the Coleman/Czarnik line a chance might be bad for UND. And, it was. – Ben Paulides picked up the physical game in the 2nd period playing the heavy for a team without a lot of it. – Austin Czarnik has been outstanding shadowing UND’s Mark MacMillan everywhere including behind the net tonight. He will have skated a full marathon and then some following the completion of this game. – Alex Gacek has also been throwing the body despite his rather small size. – Miami began to allow too much space, and accordingly, odd man rushes to UND in the second half of the period. However, they have played the most responsible game I have seen them play in a long while. Can they keep it up in the 3rd? – Matt Caito has now blocked 4 shots tonight and Miami has blocked 14 overall. UND has blocked 10. – Coleman (5) and Barber (4) lead Miami in SOG. – Both Miami goals have come from the same spot on the ice — right between the circles in the premium zone. UND did not get a shot on goal in the 2nd period from that location. Miami did a terrific job keeping the UND shots to the outside. They must continue doing it. – They are showing the damn BU highlights on the big screen. Please stop. Let’s see if the boys can finish. Go RedHawks! 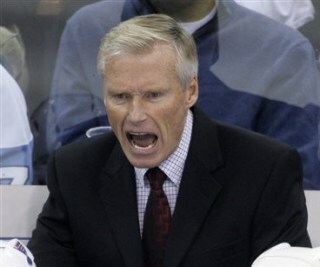 – Miami came out flying using their speed and quickness to create separation from UND who is a physically bigger team. – The Barber/Kuraly/Louis line especially early was very good as they used that speed well. – Barber looks a little lost right now. He seems to be fighting the puck but has still been effective, especially in the neutral zone. – Ryan McKay looks very sharp thus far tonight making a couple difficult saves and keeping an eye on the crazy bounces off the boards and glass. – Blake Coleman was all over during Miami’s second power play. He had three quality chances cashing in on the last one as he recovered a poor UND clearing opportunity, spun and fired a wrister that beat Gothberg high. – UND began to impose their will late in the period picking up the hitting and winning battles for loose pucks and along the walls. Miami will have to hold strong and roll their lines to avoid fatigue against UND. – SOG favor UND 14-9 with Blake Coleman getting credit for four of those. UND attempted 28 shots in the period to Miami’s 19. – Miami has already blocked 8 shots tonight with Caito and C. Joyaux getting two each. – Miami leads in faceoffs won with a 14-8 margin. Czarnik was 5-2 with Kuraly at 5-4. – Overall, Miami actually looked competent defensively and backchecked fairly well. They will have to keep that commitment up throughout the night in order to prevail.